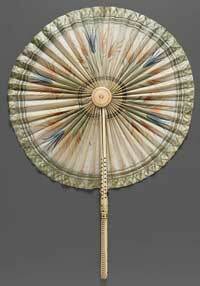 This page attempts to record what is known about the origin and history of Pleated Paper Fans. Please contact me if you know any of this information is incorrect or if you have any other information that should be added. Thank you. There are two different kinds of pleated paper fans, circular fans and collapsible fans. Fans of both types can be made of other materials as well as paper. 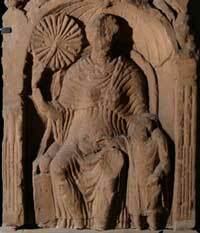 This picture of a carving on a Roman gravestone in Tullie Museum in Carlisle, UK, that can be dated to around 450BCE, shows a pleated circular fan that was probably made of parchment. 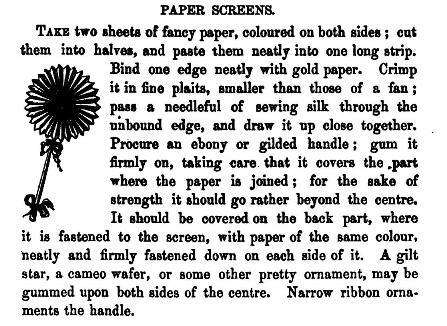 In terms of recreational paperfolding the earliest appearance of instructions for making a fan of this kind appear in 'The Girl's Own Book' by Lydia Marie Child, which was published by Clark Austin and Co in New York in 1833. 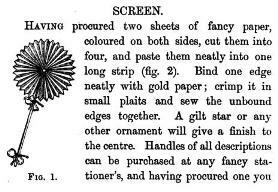 Similar instructions appear in 'The Girl's Own Toymaker' by Ebenezer Landells and Alice Landells, which was published in 1860 by Griffin and Farran in London and Shephard, Clark and Brown in Boston. 'The folding fan (Ogi) as opposed to the much older fixed or flat fan (Uchiwa) is popularly thought to have originated in Japan around 670 A.D. made of wooden or bamboo strips threaded together and secured by a rivet or pivot. The oldest surviving wood strip fan (Hi-ogi) was discovered in Nara City, Japan dating to 747 A.D., while the oldest known Chinese or Korean folding fans of a similar type date to the 10th Century A.D.
Remains of the oldest surviving paper folded fan were found in Akitsu, Japan and can be dated to the late 11th century/early 12th century A.D. The earliest diagrams for a pure origami pleated paper fan that I am aware of occur in 'Le Livre des Amusettes' by Toto, which was published in Paris by Charles Mendel in 1899.